The Russian nuclear-powered icebreaker Taymyr is returning to its home port after tiny cracks in the first cooling circuit of the ship’s reactor were found to be leaking large quantities of cooling water, sources told Bellona web. Increased radiation levels were observed in the reactor room of the Taymyr, and upon visual inspection, a hole, which is leaking some 20 to 30 liters of cooling water a day, was discovered in the welding, a highly placed source within Atomflot, the port that houses Russia’s nuclear icebreakers told Bellona Web. The cause of the hole is currently thought to be either metal fatigue, faulty welding or both. The Taymyr was working in the Yenisei Gulf on the northern coast of western Siberia in the Kara Sea on May 3 at 3 pm Central European Daylight time when the incident was discovered, Rosatomflot, the shipping division of the state nuclear agency Rosatom, said in an official statement in Russian. It remained unclear as to why Rosatomflot delayed the announcement about the incident on the Taymyr until today, two days after it happened. 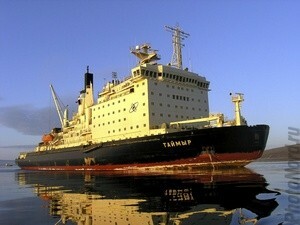 The statement noted that the ship’s trip back to its home-port at Atomflot in Murmansk is expected to take five days. The Rosatomflot statement noted that the incident was being reported as Level zero on the seven-point International Nuclear Event Scale, seven being a Chernobyl or Fukushima Daiichi level catastrophe. Zero does not qualify for ranking on the INES scale. Rosatomflot’s official statement further reported that a “small increase in radiation” aboard the vessel had been noted, but did not specify where and described it as “insignificant.” If the condition about the Taymyr worsens, said Rosatomflot, it can return under diesel power. But according to the source that spoke with Bellona Web, the vessel will assume diesel power as soon as it passes out of the Kara Sea through the so-called “Kara Gates” and shut off its reactor altogether because of the damage to the cooling circuit. The reactor’s output has already been lowered to 30 percent. Another Russian nuclear icebreaker, the Rossiya is on hand to help the limping Taymyr by smashing through the ice and guiding the Taymyr back to port. The Taymyr had been accompanying a flotilla of commercial ships to the northern Russian port of Dudinka, and was en route back to Murmansk when the reactor coolant leak was discovered, the highly placed source told Bellona Web. The Taymyr has been in service for 20 years, making metal fatigue or faults in the welds a distinct possibility. The reactor itself is always located in water, also lending to corrosion. The highly placed Atomflot source said that nearly identical incidents had been registered on three other Russia nuclear icebreakers. Engineering documentation for these Russian icebreakers even account for such faults, and lay out defence mechanisms for such occurrences, said the source. Leaking and failing cooling systems is an especially touchy subject within nuclear industries world wide, as the quake and tsunami that lashed the Fukushima Daiichi plant in Japan on March 11 led to a total loss of cooling mechanisms for reactors an spend nuclear fuel storage ponds. Technicians in Japan have been focused almost solely on keeping the reactors cool after their cooling systems were destroyed. A Rosatomflot press conference, which will amend its current understated public statements is expected tomorrow, said the Atomflot source.